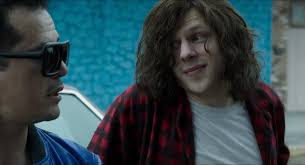 Jesse Eisenberg (Now You See Me) and Kristen Stewart (The Twilight Saga) star as two slackers-turned-secret weapons in the action-comedy American Ultra arriving on Digital HD November 10, and on Blu-ray Combo Pack (plus DVD and Digital HD), DVD (plus Digital) and On Demand November 24 from Lionsgate Home Entertainment. 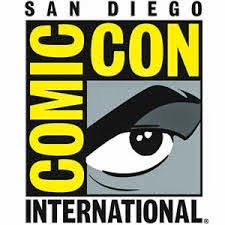 The knockout adventure from the director of the hit comedy Project X also stars Topher Grace (TV’s “That 70’s Show”), Connie Britton (TV’s “Nashville”), Walton Goggins (TV’s “Justified”), John Leguizamo (John Wick), Bill Pullman (Independence Day) and Tony Hale (HBO’s “VEEP”). Mike (Eisenberg) shares a small-town life with his girlfriend Phoebe (Stewart). But Mike’s sleepy world goes wild after he discovers that he’s actually a CIA sleeper agent with lethal fighting skills—and the target of government hitmen. Mike, the ultimate slacker, transforms into an ultra-attacker as he and Phoebe fight to survive in this exhilarating adventure. Mike Howell (Jesse Eisenberg) works at a convenience store employee. When he’s not sweeping the floor, he sketches a comic. He doesn’t even have the drive to get all of the comic stories down on paper. Most of the stories are told to his girlfriend Phoebe (Kristen Stewart). Hoping to propose to Phoebe, Mike has planned a trip to Hawaii. Unfortunately he cannot make it past the airport bathroom because a panic attack set in. Phoebe is used to Mike and his phobias and says she doesn’t mind missing out on the vacation. CIA Agent Victoria Lasseter (Connie Britton) was in charge of the Ultra program. When the program failed, she relocated Mike to the small West Virginia town. He was given phobias designed to keep him from leaving. Lasseter learns that Adrian Yates (Topher Grace) is about to eliminate Mike. His Tough Guy program has succeeded and he orders his assets to take out Mike. Lasseter activates Mike in order to save him. Mike has no recollection of the program and doesn’t know what’s going on. When the first tough guys come to harm him, he discovers that he has all kinds of new abilities. He can, and does use spoons and dustpans to kill his attackers. After killing two people in the store parking lot he immediately calls Phoebe for help. They never really explain why but Yates is certainly out to destroy Lasseter. He does everything he can to destroy her program, her asset and even her. Without the proper authorization, Yates launches a full scale operation in the middle of Mike’s town. The media story is that there is a monkey virus and that Lasseter has had inappropriate contact with the monkeys. The action part of the movie fails for me when Mike seems to get lucky when he doesn’t die. He doesn’t really appear to be the physical superior to any of the tough guys chasing him. The comedy part fails when they joke about Lasseter sleeping with monkeys and Mike’s drug dealer/friend (John Leguizamo) throws around the N-word when talking to literally anyone. Additionally, it never comes up that the CIA isn’t even supposed to operate on US soil. I know the CIA sounds scarier but the writer should have made this an FBI program gone wrong, or explained how the CIA pulled off a large operation (even outbreak monkey based) without calling attention to themselves. 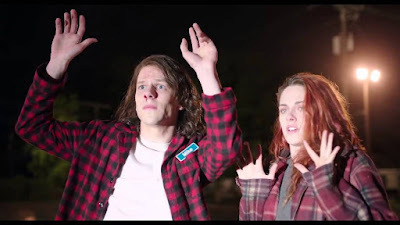 Both Jesse Eisenberg and Kristen Stewart are very believable as young, white trash, stoners. The film is well cast, it just isn’t particularly well written. If you’ve just been to see Spectre and are itching for more spy-action, American Ultra probably won’t satisfy you. 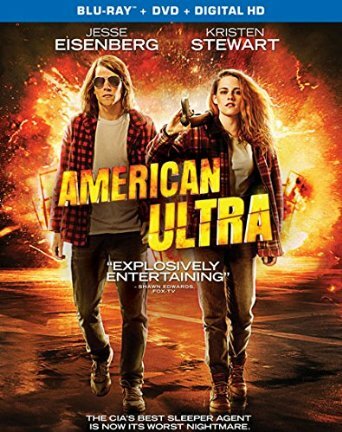 American Ultra is presented on Blu-ray with an AVC encoded 1080p transfer in a 1.85:1 ratio. Much of the film takes place at night with the fluorescent lighting of the convenience store or the poor lighting of a police station providing a washed out look. In close ups fine detail is still good. As Mike’s bad day continues, his flesh takes on a variety of bruises, cuts and blood stains all of which are realistic. The explosions and other effects do not lead the viewer to question their authenticity. American Ultra’s DTS-HD Master Audio 7.1 track delivers sound quality worthy of a Bond film. All channels are thoroughly explored with explosions and gun fire vibrating your home theater. A fireworks explosion will certainly make you take note, as does a drone strike in the latter half of the film. With all the crazy action, dialogue does not get overwhelmed and is intelligible throughout the film. Audio Commentary – Director Nima Nourizadeh provides feature length commentary. Activating American Ultra (40:22) – This featurette, which should have been edited down, takes a look at all aspects of the production. Assassinating on a Budget (3:25) – A look at the available resources Mike turns into deadly weapons. American Ultra tried to mix action and comedy in a way that did not work for me. I wasn’t touched by the love between Mike and Phoebe and really didn’t care who made it out alive. It wasn’t satisfying enough when the bad guys bit it and I didn’t feel like cheering when the good guys prevail. Eisenberg and Stewart have good chemistry but needed a better supporting cast. I’m not ready to wave anyone off from giving the film a try but you might want to rent it before you pay Blu-ray prices for a new release.